Q&A: Chris Perez on His New Book "To Selena, With Love" - Fueled by chile, frijoles & tortillas. All of 17 years ago, in the immediate aftermath of her death, Selena Quintanilla Perez’s husband, Chris Perez was the one person we rarely saw anywhere, making any comments on behalf of himself or the Quintanilla family about her passing. In fact, until his 1999 studio album with the Chris Perez Band it was sort of like he had disappeared all together. Even when he did come out to promote his new music he rarely said much about his late wife. In his new book, To Selena, With Love, released this month, Perez explains that in a lot of ways he had sort of disappeared into himself. The book tells the story of Selena and Chris from Chris’ perspective, in what he hopes will shine a new light on the legendary Queen of Tejano Music as a woman. The woman that he fell in love with, married and lost. Juan: Why did you feel now was the right time to share your life with Selena in such a public way? Chris: What makes it so surprising to a lot of people that I actually did it in the first place is because I was the one that always said… “I’m never going to do that… I’d never see myself doing this” …but then it’s true what they say, I guess, about time kind of healing. I don’t know if we can ever heal 100 percent from something as tragic as what happened, but with time you do start to see things in a different light and things change. I’ve been through a lot in life after her death that it just kind of… I felt like I had suppressed a lot of memories in thinking it was helping me deal with it, with the loss of her… it’s one thing to lose your wife in the way that it happened with Selena, but it’s also another thing to be in the same industry that she was in and to be surrounded by her image, videos and music all of the time… I couldn’t go to work and escape it so to speak. It was overload for me. I think that’s one of the reasons I kept everything sealed up… In a way this is kind of my way of me dealing with everything. Juan: I can’t even begin to imagine how difficult those first few days afterwards must have been like for you, can you tell me anything about that time in your life? Chris: It was almost like going into shock. It’s not that you don’t feel anything. It’s more like you just sort of go numb… As corny as it sounds, things are just not the same after that. The colors aren’t as colorful as you thought they were. The food doesn’t taste the same as you thought it did. Things don’t feel the way they did before… It kind of shook me down to the core. The best way I can describe it is numb, going numb… it’s too much you know… Looking back on it now, I lived a lot of my life after her passing with blinders on. Juan: In the immediate aftermath of Selena’s passing her family was at the forefront of communicating with the media. We didn’t see you for a long while. Where were you during that time? Chris: I locked myself up. I couldn’t even take the trash out. I had the Porsche, her red car, in the garage and it was surrounded by plastic bags full of trash. I couldn’t take it out. I would have to wait until four in the morning when friends of mine and I would load up pickup trucks with bags and go and dump them off at the dumpster where nobody could see us, and that was pretty much the only time I left the house… From March 31, 1995 until the following year in November I was that hermit… for that whole time I didn’t move anything of hers. It was like she still lived there. Juan: How did you find out about what had happened to Selena that day? Chris: I didn’t find out as soon as I should have because that afternoon she had taken my truck and my phone. She had a really bad habit of just leaving her keys wherever, as well as her cell phone… but that day, with everything that had happened with Yolanda, she got up really early… I didn’t even know that she was leaving. I woke up as she was leaving and didn’t even ask her where she was going… so she had my phone and there was no way to get a hold of me… I was with my father running errands and nobody could get a hold of me. I came home after everything had happened… When I got the call, her aunt told me that she had been in an accident. I assumed it was a car accident and she was in the hospital. I asked what happened and she said she was shot two times, which wasn’t true… she got shot one time. After that we just ran out of the house and went to the hospital. Never once thinking that what had happened was possible, that she wasn’t going to make it. As a matter of fact, I already had my speech for when I got to the hospital to get after her for going by herself and not telling me to go with her… I kind of walked in sort of with a half smile thinking “where is she?, let me at her”, and that was when Abraham just looked at me and told me that she was gone. You can imagine, it was like a ton of bricks falling on you. Juan: Do you feel in writing this book, that this is sort of like letting her go or moving on with your life after all this time? Juan: Are you still in love with her? Chris: Yeah, I always will be. Of course! To this day – I mean I’ve said it before – I’ve never met anybody like her. She was definitely one of a kind. Juan: And inevitably people are going to think that maybe this is about making money, above all else, what would you say to these people? Chris: Well they can say that. I don’t even need to respond to that. They’re going to say that. It’s inevitable and I knew that going into it. And there is nothing I can say that would change their mind. In other words if I have to explain it to them, they’re never going to get it. Chris will be in Houston tomorrow signing copies of his new book. FTC Disclosure: Juan of Words received a free copy of the book from the author as part of a Penguin Group (USA) Inc. book tour. Juan of Words was not required to write a positive review. The opinions expressed are my own. Ask Juan: Why is Spanish so Hard to Learn? OMG I can’t wait to read this book!! I can’t believe you actually talked to him!! I hope from the bottom of my heart, if only for people like Chris and Selena, that there is a reuniting of spirits and loved ones after death on earth, a reuniting so powerful and real that it erases all the past hurt and anguish, because a love like this is so rare. I get caught up in the story of Selena and their relationship more often than I’d like to admit, and it just haunts me and dare I say- paralyzes me in a way because all I can think about is the tragedy that ended her life. It might seem extreme or dramatic but her pure and enthusiastic essence touched my soul, and I am a hopeless romantic, so this love story really affects me bc love is #1 to me. I know that he will always love her but I really hope he has found a healthy way to heal and continue on with his life by finding meaning that is not connected to her bc on the other hand it must be so draining and painful to have something like this on your mind constantly for the rest of your life. Then again, that’s what makes it so beautiful. I hope, and don’t doubt, that she visits him in spirit and in his dreams…. What a great interview! I am really impressed with your connections and your ability to ask the questions we really would want to know. Such a horrible way for a beautifully sweet woman to die. Thank you so much, humincat! I’m very happy you enjoyed the interview. It was very important to me to present what he had to say in a transparent way. Un abrazo! He sure is! There is so much interest in this book already… and it just came out today! I am at work sitting here with tears welling up in my eyes. Thank you for posting this. You did a great job. Amazing interview Juan! It was done with respect,admiration and thoughtfulness. Thank you for sharing this with all us Selena fans. She will never be forgotten. 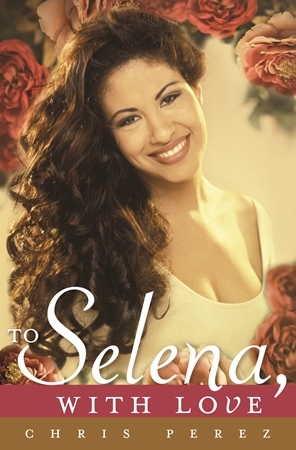 I am soooo happy dat CHRIS wrote dis book about SELENA it shows dat his love for her is 4EVA & I own dis lovely book….17 yrs later & she iz still da best….SELENA= da gr8test & most beautiful latina singer eva!!!! SELENA 4 EVA!!!! Wow, what a wonderful interview to read. Well done Juan. I choked up reading the review of Chris’ book and the interview. She was truly a wonderful person and Chris obviously was too, so I can see why she loved him so much, and vice versa. Selena and her husband Chris Perez were a sweet beautiful young. couple .I red Chris book and I love the way he tslks about Selena he really admires her ,loves her and also respects her,venerates her memories and her legacy. The book is EXTRAORDINARY!!! it shows Selena in a totally different way!!! many of the chapters are funny, kind, generous, respectful and vulnerable! Chris And Selena were a one of a kind couple she may not have been able to have kids as she always dream of but she won the heart of an AMAZING man Who to this day is still madly in love with her he always will be! !! Thank You Chris and God Bless you for everything you have done to keep her in your heart and in ours!!! i went to his book signing HERE in San Antonio He is an AMAZING man and sooo nice He is also still very handsome!!! i told him that Selena would be proud and thank you for this book! !he wrote a special not in my book and I’LL TREASURE FOREVER!!!! What a wonderful interview. Selena’s world with Chris was a beautiful love story… Can’t still imagine the magnitude of his feeling by loosing someone so meaningful in his life. He is right about us seeing Selena as our Tejano star, to him she was everything, and still is, as the love of you life is. Chris, i will love to get a copy of you book as soon as I get a chance. And “whatever” about what people may say, I personally appreciate you for keeping her in your heart as day one, so we do. Thank you for sharing a part of her that not even her family would known but you and only you. My respect and heart forever for you and my so beloved Selena! I’m really late for this, but I’m glad I found it. I stayed up late googling Selena after being reminded of her amazing talent and how it made me feels as a child when my parents would listen to her music, then I stumbled upon this. Such an amazing and in depth interview. I was fine until I read, “For that whole time I didn’t move anything of hers. It was like she still lived there.” When I read that, I lost it! I couldn’t control my tears. It’s so sad that she was taken so young and the way that she was. May she rest in peace. Thank you for posting this interview, keep up the great work. This is an amazing conversation. It was a shocking emotional to Selena. What a beautiful interview. Chris comes across as such a humple and passionate person, still holding a deep love for Selena. He has been so respectful all of these years following her passing and I can’t wait to read the book, to read his memories of there life together. I enjoyed reading your interview with Chris. I can’t wait to read the book. It would be so awesome if Chris will continue to keep Selena’s dream going with opening up a Selena perfume line. As I read in one area …Chris talks about Selena’s dream was having a perfume out. If you ever get to speak with Chris once more that’s something many fans would like to see. Thanks again for sharing the interview. Juan no no Chris is a jerk a Liar, He is not a good Man. He got every body fooled. But some other People do not use logic and senses. They killed Selena. Chris and Yolanda. Selena was a sacrifice for Chris to be free to form His own band and to have a life of partying and cheating in which he could not do if Selena was alive. Some Selena Fans along with Me learned the Truth. Chris Sacrificed Selena. He was with Her for Money,Name, and Fame. Even in death He is still using His Wifes Name to Sell His Book and album. Karma will soon come at Chris for Sacrificing Selena. "Selena, I'm still dreaming of you"
hi. im a selena fan and i dont understand, if chris is deeply inlove with selena, how come he married other woman? sorry for asking but i just dont get it. i mean the feelings that he had for selena but when selena died he married other woman and got divorced and then he still love selena? sorry for asking but i hope somebody would still answer. Chris loving another women will never stop him loving Selena. Its just the way he loves is different from you and love is a real magical arbitrary thing. have a feeling he knew he had to keep on living and he knew Selena would be mad if he didn’t live his life happily.I have a feel Vanessa took care of Chris the best she can.I feel like she helped Chris with what he went through.I mean I know what you mean by how fast he got married and had children with her but love is an arbitrary thing. I can’t really tell you his business about the divorce cause no one has the right to criticized it. There is nothing wrong with loving someone else other than Selena.